Heritage History is a traditional narrative history curriculum for homeschoolers. The online library contains biographies, legends, adapted literature, and introductory histories. All were written for the general reader and are easy and enjoyable to read. Basically how it works is that you enter the Heritage History site and go to their library lists. There you will see hundreds of books to explore. You can search by title, author, civilization, or genre. The titles are colored coded depending on level: green for elementary readers, brown for intermediate, and red for advanced readers. What's so great about these products is that by using the narrative approach to history, Heritage History is able to restore interest in both popular and long-forgotten historical stories and events. The focus is not on analysis, it is simply an emphasis on the story of history. Geared primarily to young people's history; there are several books of interest for adults as well. None of the books in the Heritage library require specialized knowledge of economics or political philosophy. Only an interest in the subject matter and some familiarity with the historical era is required. We received the Ancient Rome Classical Curriculum CD to review. This CD includes over 40 classical stories ranging from simple to advanced in difficulty. There are also hundreds of pages of study aids that include maps, vocabulary, and timeline material. All this for the low price of $24.99. If you don't have access to an affordable printing option, you can order the study guides already printed for $24.99. As anyone who reads this blog already knows, I am generally averse to computer-based education for my kids. With that in mind, I am surprised to find myself so excited about this curriculum. First, by and large this is a small PDF library of books that we already use for our history curriculum. Since I don't own most of these books (but check them out from the library when needed), this greatly reduces any costs for purchasing them, and frees me of any hassle trying to find shelf space for them. An added bonus for us is that we can download the books to James' Kindle! I even created a folder on his Kindle for History Books and now he can grab his Kindle and have easy access to tons of historical reading material. Be sure to check out the Spring Sale going on now on the website. Buy two titles and get a third title free! There is also a drawing for a free Kindle Fire. Enter soon, the next drawing is June 1, 2012. Interested in knowing more about a product other than the Ancient Rome CD? My TOS Crew members reviewed a wide-variety of products from Heritage History. Head over to the crew ship to read their reviews. One final note. If you could only buy ONE product that I have reviewed this school year, I would tell you to purchase history materials from this company. It is hands-down the BEST product that I didn't know we needed! 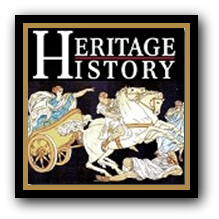 As a member of the TOS Homeschool Review Group, I received the Heritage History Ancient Rome CD for free in exchange for an honest review on this blog. I received no other compensation.